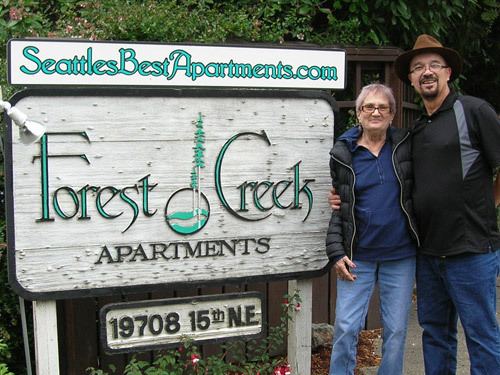 Jose and Jan Berumen bring nearly 20 years of apartment management to the table as your Forest Creek Resident Managers. They moved to the Seattle metro area from Eastern Washington 12 years ago because of Jan's love of the metropolitan life she had been missing for so many years, with its blend of cultures she is all too familiar with. They have two children and 5 grandchildren. Their daughter, Monica, lives in Bellingham, WA and son, Zachary, is a school principal in Lancaster, California. When time permits, you will find Jose fishing, be it in a boat or along a river at one of his many "secret" fishing holes. In Western Washington he fishes Lake Washington but his favorites are the Pot Holes and the Columbia River in Eastern Washington. Born in Eagle Pass, TX, his family moved to Eastern Washington in the early 1960s, settling in Grandview, WA. Jose and Jan try to attend the annual family reunion (Jose's family) every couple of years, meeting up with Jose's four brothers and two sisters! It is quite the gathering! As a child, Jan lived abroad in such countries as Germany, France, Turkey, and Saudi Arabia, until she was 22. Her father's company was a contract support group working in concert with the American military advisors and NATO, often in very remote locations where there were no other families. After being home-schooled for a few years, she went on, at age 12, to attend boarding school in Switzerland, but summers and periodic school breaks were always spent in whatever country her parents lived at the time. She went on to attend the University of Georgia in the U.S., but her love of living abroad took her home even then during breaks. She thanks her father for instilling in her the understanding and appreciation of people no matter where they were from and to always respect their differences. Languages are her passion and she speaks a little French, German, Turkish and Arabic. Jose and Jan are delighted to be at Forest Creek. You can contact them at 206-361-9198 for more information and to schedule a tour of this beautiful community!